Tiger is the embodiment of courage, abundance, and magnificence. 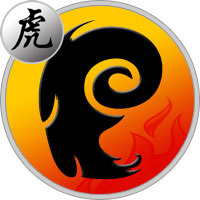 Many Aries characteristic are Tiger qualities, so as an Aries Tiger you are doubly blessed with a spirit of aliveness. You’re exciting, intelligent, very persuasive, and highly motivated. You particularly excel in positions where you can create your own kingdom yet be a public figure – for example, in show business or the creative arts. You’re an impassioned lover who can also be undisciplined and uncompromising. As a result, your Aries Tiger love life tends to be filled with emotional drama. What can one say about this combination? You’re somewhat an "Aries squared" — a sign where all the tendencies common to the general Aries are exalted and amplified. It’s not easy for you to live such a situation as your personality is so explosive. Your impulsiveness is the highlight of your character. You act and react so quickly that you generally have no time to compose with circumstances or with other people’s feelings. Nevertheless, sometimes, quite unexpectedly, you can have a hesitation, a doubt, as if something succeeded in pulling at you or retaining you in front of certain dangers. You’ll overcome your egocentrism with difficulty because your self-assertion is so strong. This, however, does not prevent you from having a great outburst of generosity and abnegation every now and then. You like dangers, not hesitating to come close to precipices. Your feats of strength are not always successful because you lack precaution. You can sometimes imperil your fortune or your reputation by imprudence or defiance. In love, you’re excessive in your outbursts, and your sexuality often takes precedence over your sentiments. Loves at first sight, like thoughtless decisions, stand out as milestones in your life, and it’s not rare that you live numerous unions and no less numerous break-ups in the course of your existence. You need above all to preserve your entire freedom in union or marriage. As much as resistance and novelty stimulate you, as much as capitulation and routine bore you.